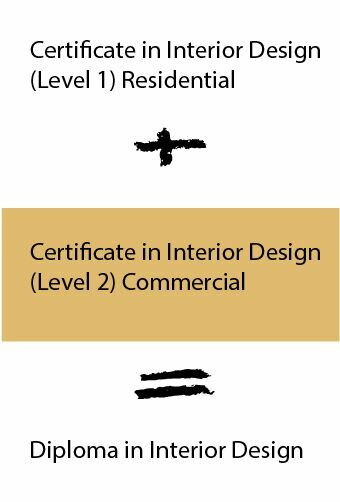 The Certificate in Interior Design Level 2 (Commercial) will teach you how to develop and design commercial interiors, ranging from hotels, bars, restaurants and workspaces. Available full or part time, it is the second of two programs in our Diploma series. Covering all aspects of commercial design – from the preparation of client materials to project management – this course will give you the opportunity to work on three real-world projects (retail, food & beverage, and office space design), interact with and present your final proposal to the client, and develop advanced creative and technical skills using design software. Not only will this course give you the skills to fully complete a project start to finish, it will expose you to the vast network of Insight School’s connections, enabling you to develop and expand your professional network. It will also give you a foot in the door to the industry via our one-month internship program, which 95% of the time results in full-time employment. Graduation from this program, combined with the Certificate in Interior Design Level 1(Residential), completes the Diploma in Interior Design. I thoroughly enjoyed the content and quality of teaching, the school environment and support. Each of you have a clear passion to make the school work and is a testament to who each of you are and your background. I will miss you all and the school. Everything is focused on real-world teaching, we meet with clients, we interview them, learning what they want and apply it to our design before we present it to them at the end of the project. I like the teaching method as it is very practical and you learn by working on your own projects. Also, the fact that the groups are small so that you get a lot of attention from the teachers. I enjoyed all the site visits and learned a lot from them. I also appreciated very much the high-level clients that we got the opportunity to meet and work for. "It’s been intense, inspirational, exhilarating, engaging, frustrating, fun, stressful and stimulating. It’s been a roller-coaster journey but one well worth taking. Thank you for making Insight School such a great place to attend school and making us proud of our achievements!"